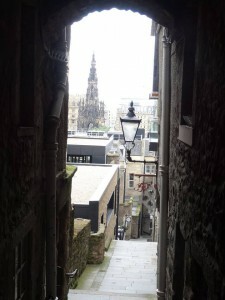 After visiting Edinburgh Castle during the previous weekend, I was determined to dive deeper into all those things that are typical for Edinburgh. One of the most iconic ones? 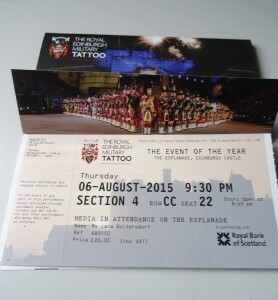 The Edinburgh Royal Military Tattoo! The actually affordable tickets (starting at 25 £) are usually sold months in advance but Catherine – always eager to help us to enjoy the best Summer of HPC possible in Edinburgh – told us about the preview. Before the Tattoo actually starts, there is one date where they do the full thing for the press so they can take pictures of the cast doing their performances. It’s just like a regular Tattoo show plus press everywhere but the tickets are only half the price and they are only sold about ten days before the preview. What a great opportunity to experience the Tattoo spontaneously without spending a fortune on it! As it turned out, the sale of the preview tickets started on the Monday of our forth week at 10 am. My attempts to buy a ticket online were obstructed by several error messages of the website (sometimes turning completely unresponsive) and a payment system that was apparently not designed for being used by people with debit cards not issued in the UK. After being prompted to enter data that is not noted on my card and being told that the same card I successfully use to buy groceries and pay bus tickets is invalid several times, I gave up buying tickets online (or using the telephone which requires the same data) – but I didn’t give up buying tickets! At 10.30, I looked up the location of the Tattoo shop and went to the bus stop. Buying the tickets in the shop is slightly cheaper anyway as there is no booking fee charged! The drawback was the queue. Very long, moving only at a slow pace and outside while the weather was very Scottish. Rather cool, windy, slightly wet. The usual stuff. At this point, after three weeks in Edinburgh, I’d got used to it and just carried a jacket everywhere. Slowly, I moved forward and quite a while I was finally allowed to enter the shop and join the queue inside. This one moved faster though and the lady behind the counter really went out of her way to help me! I told her about my problems ordering online and that I originally wanted the reduced voucher for the official Tattoo program as well which is limited to online orders. As a response, she offered to handle my purchase as an online order without the pesky debit card trouble. There were some technical problems, but in the end I got my voucher and a ticket for a really nice seat that should offer a great view. It was already lunch time when I walked out of the office and since the food sold on the Kind’s Building campus is neither cheap nor exceptionally good, I decided to have lunch before returning to my office. When I returned to EPCC, almost three hours had passed, but at least I had my tickets and now could focus again on my work and the run times I measured over the weekend. 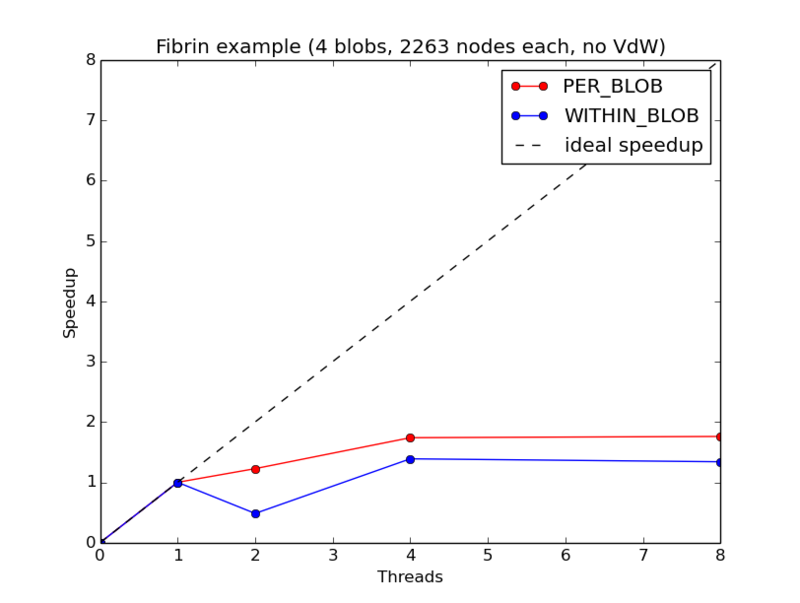 The “within-blob strategy” uses several threads to do all the calculations of one blob. However, it doesn’t work good if there are many blobs as they still get dealt with sequentially. All the threads always work on the same blob. On the other hand, the “per-blob strategy” assigns each blob to a thread that does all the calculations related to this one blob. 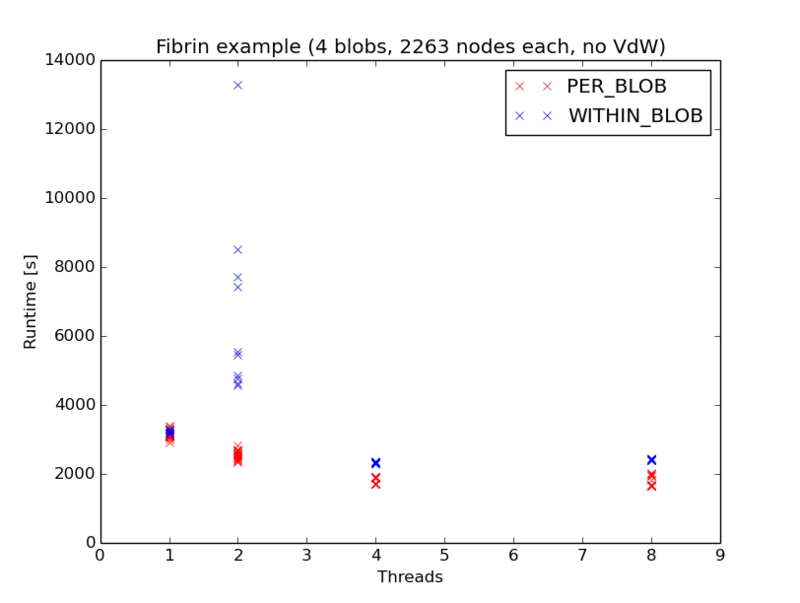 There is no parallelism within the blob, that’s why it doesn’t work good if there are more blobs than threads. As you can see, the per-blob strategy does better for this example, but in fact, both are far below the ideal speedup. The speedup is a measurement for parallel performance. It’s calculated by dividing the serial run time through the parallel run time for a given number of threads. Ideally, using two threads should halve the run time (reflected by the ideal speedup graph) but that’s only possible if the whole problem can be divided into independent sub-problems which is often simply not possible. I had many run times but needed only one to calculate the speedup. There are many possibilities how to reduce many values into one, from just randomly choosing one value to the median. I chose to use the mean value because it’s simple and there was little deviation (except for the within-blob parallelisation with two threads which is basically only deviation). Another thing I realized this week was that it was the last week in July! Not only it meant that half our time in Edinburgh had already passed but also that the festivals were about to start! While it generally means that there will be more opportunities available for us, it also means that some attractions will close down for August because of the crowds rolling into the city. The overground tour of Real Mary King’s Close is one of these things and since I wanted to attend it, I had to find some time for it this week! Closes are narrow streets that cut through Edinburgh’s Old Town – often slightly claustrophobic (but less than they used to be in the 1600s) and really steep but also incredibly useful as short cuts (if you know where you’re heading). While the Royal Mile is the Old Town’s spine, the closes, courts and wynds branching away from it are what gives it its very distinctive character. Most of them are still used – some just as a short cut, some for housing or shops – which inevitably changed their face a bit as the centuries passed. But when the Royal Exchange was built mid-18th century, some of the closes – among them Mary King’s Close – were used as the foundation for the new building effectively placing them underground. Eventually, they were closed off and therefore preserved an impression of how life was in Edinburgh back then when the life expectancy was 35 years. This impression is strengthened by the guides playing historic characters whose lives were connected to Mary King’s Close. For example, my guide for the underground tour was Jonet Nimmo, Mary King’s youngest daughter. Afterwards, I joined the overground tour. As I was the only person who participated in this tour, I got to enjoy the full attention of my guide – this time, it was a merchant named Stephen Boyd. While I already knew quite a bit about the things he told me after living one month in Edinburgh, it was still a very enjoyable experience and once again made me appreciate the city even more.